I was the first one up this morning, Richard was awake a little later and then he woke Dennie. Good thing because Emanuele arrived 15 minutes early for our Rome apartment checkout. Thankfully, Richard had realized that I made a 2 hour mistake as to when our train to Florence was. I called Emanuele yesterday afternoon and he was able to rearrange his schedule. He did a quick check through the apartment and finding nothing amiss, he returned our Security Deposit. Woo hoo.. a little extra cash to spend on the rest of the trip. It was a cloudy day and looked like rain with it being the same forecast in Florence. Our little elevator was stuck for the first time since we arrived. Richard carried his suitcase down the stairs and Emanuele carried mine. Dennie waited for us to get downstairs and send the elevator back up for him and his suitcase. We were going to walk over to the Piazza and catch a cab, but decided to just have Emanuele call a cab for us. We were on our way to Termini Train Station. We had 90 minutes before our train would leave for Florence. We were approached by a young gal with an identification photo tag around her neck and asked us if she could help. We showed her our train ticket and she said to follow her and she took off almost running it seemed like. We followed and when we got to the area outside the train platforms she promptly told us it would be 5 € per person with her hand out. I told her it would have been nice had she said that in the beginning. I gave her 4 € and Richard gave her 1 to which she said, ‘No, 5 per person.’ We just walked away from her – our first scam artist! After we walked away I wondered why we gave her any money at all, live and learn for the next time. Since we had so much time before our train Richard and Dennie got coffee and the Italian idea of breakfast, a sweet roll. I then had my first espresso since arriving – well, first one that I didn’t make that is. When I brought it to the table Richard from that point on, would refer to it as a ‘Thimble full of coffee’. I rather liked that description. Richard and I used the washroom and it was for me, my first Paid Toilet Stop, or W/C as they are called. 1.5 € Euro to use the bathroom, but it was clean and that was the important thing. We saw the gal that scammed us earlier, talking with some other unsuspecting tourists downstairs. We should have gone over and warned them! I wandered around the station looking for mints of some kind or hard candy to combat my constant dry mouth. To my surprise, there was a Hudson News stand, just like at O’Hare airport in Chicago. A little piece of home in Italy. We boarded our train without incident other than my suitcase seemed to be gaining weight despite not adding anything to it since we left home. Something else that I need to work on before my next trip. I better start writing down these ‘Things To Accomplish” before my next trip so that I remember to do them. I knew that there isn’t anyone to help with luggage on the trains and that I would need to get it up the steps myself. We really didn’t have any idea what the storage situation would be on the trains. We could see from the Trenitalia website that there appeared to be some type of storage at one end of each car. The last time I’d weighed my suitcase at home it was 27.2 pounds, when it was weighed at O’Hare, it was 32.5! Richard got on the train first, and then I handed him my suitcase from the platform. Across from the bathroom, at the end of the car (and the end that we got on from) there was a small area for luggage. Thankfully we were one of the first to get on the train so there was room for his and my suitcases. Richard hoisted my suitcase up onto the rack, something I would not have been able to do myself without wrenching my back I’m sure. Dennie was smart and travelling with just a carry-on. We found our seats and were quite satisfied with our purchase of 2nd Class tickets. We didn’t see any reason for paying more for 1st class as these seats were quite comfortable and roomy. 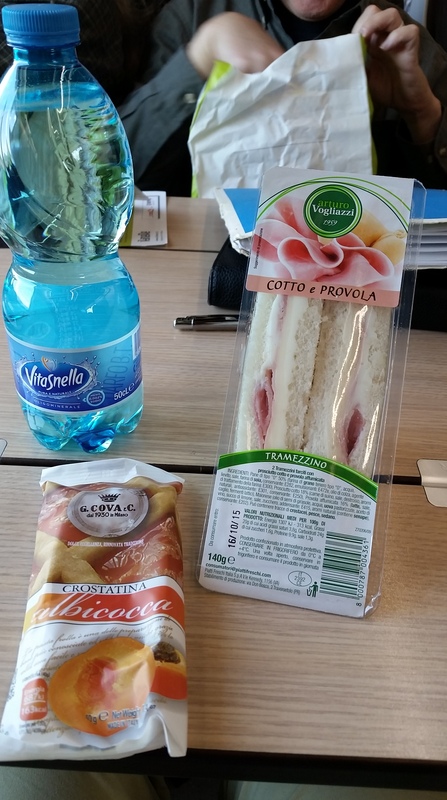 We each ordered the snack they were offering for 3.50 €. We went through several tunnels on our way to Florence and each time we did, our ears would pop. These are ‘fast trains’, they did indeed travel at high speeds at one point we saw that we were going 246 kph. The ride is however, quite smooth and you wouldn’t know you were going that fast. I used the washroom, which was quite clean and roomy I might add, and there was no issue with movement from the train. Very smooth. We arrived at Santa Maria Novella Train station in Florence and it was pouring rain. We went outside to wait in line for a taxi. It Italy, you cannot hail a cab like we do here in the US. There are Taxi Stands that you have to wait at to get a Taxi. This is true not just at the airport and train stations, but also in each city. We didn’t wait in line for very long, we did however wait once we got in the taxi. Traffic wasn’t going anywhere. Our driver eventually squeezed between a tour bus and shot out into the street, only to stop almost immediately. We eventually arrived in the Oltrarno neighborhood after making our way down some VERY narrow one way streets. I accidentally hit the wall of the building we were parked next to with the door when I opened it. I didn’t hit it hard since I could see it was going to be a tight fit. I was very careful when I opened the door. I said I was sorry, but the taxi driver yelled at me and then there was much discussion between he and Dennie while Dennie was paying him. He continued to mumble the entire time he got our suitcases out of the trunk, got back in the taxi and sped off. There was construction on our street and it was blocked off so we were left off at the end of the street. I had looked at where the apartment was on Google Street View so I knew which way to walk and sure enough, our apartment was just a few hundred feet away from where we were dropped off. It could have been confusing however as the building numbers were not in order. The first one was #6, the next was #12, the next #14, then #10 then our building, #8. 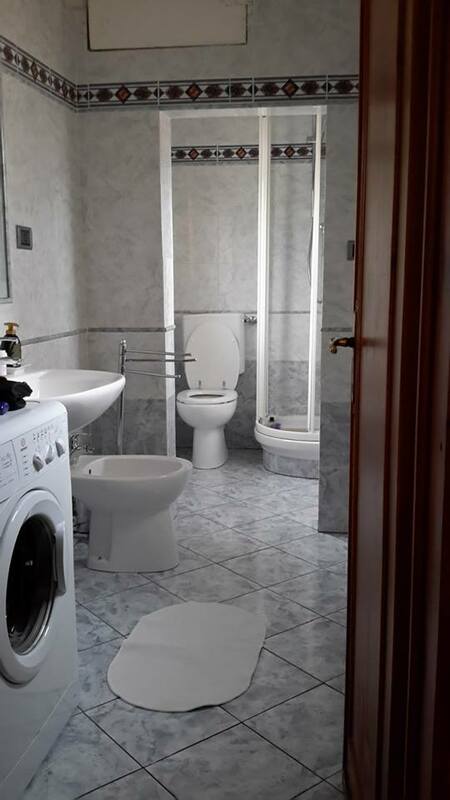 Welcome to Italy – we would find this to be quite common. Once at the apartment, we didn’t know what to do. The door to the building was locked and we had no idea what name to press to ring the bell to let us in. I had sent our contact a text message when we boarded the train in Rome and then again when we got in the taxi at Santa Maria Novella and was told the woman cleaning the apartment would be there to let us in. But of course we needed to let her know we were there to be let in. I knew the apartment was on the 3rd floor, but of course, had no idea what buzzer to push next to the names. I called our contact once again, asking how we got inside the building. In short order we were buzzed inside. Once inside we weren’t quite sure what to do. There was no one in the long dark hallway. I got in the elevator and went to the 3rd floor while the guys waited downstairs with the luggage. When I got off the elevator there was no one there and there were several apartments on this floor. However, shortly a woman came from around the corner and motioned me to follow. There were 4 other apartments on this floor, our apartment was around the corner from the elevator through a locked door with just one other apartment directly across from ours. I told her I needed to go get the others and went downstairs to bring The Boys up. I’m not sure she understood me or not. The young gal then said in very broken English that Elenora would be here soon and she left us in the apartment. Wow… it was much bigger than I thought it was going to be and from the pictures I’d seen on line. The first thing Dennie and I noticed was that the view from the living room was not what we had seen on line. From the photos that had been posted, there was a great view of the Duomo from the living room. We could see it, but not quite as good as the pictures had showed. Although later, I realized that it wasn’t the Florence Cathedral we were seeing from the apartment. It was the Basilica Santa de Spiroto. The apartment was one very long apartment with 3 bedrooms off to the right. The first bedroom was off the living room, beyond the living room was the dining room and another bedroom off of that. Through the dining room was a small kitchen with the 3rd bedroom with an ensuite bathroom. Beyond the kitchen was the 2nd bathroom with the washing machine. Dennie picked the 3rd bedroom with the en suite bathroom and I took the 1st bedroom so the far bath would be mine – I would have to time my nighttime stops ha ha. Richard exclaimed that he loved the apartment as soon as we walked in, several times in fact. The apartment in Rome was very modern with limited furnishings – the terraces were the focal point of that apartment to be sure. This one was furnished in traditional old furniture, the dining room table was huge with seating for 6 people. The floors were beautiful tile. I took the plastic tablecloth off to take pictures of the table, returning it when I was finished to protect it. Each bedroom was quite large and they all had views overlooking Piazza Della Passera on the street below. We had no sooner picked out our rooms when there was a knock at the door and a wet Elenora had arrived. She had ridden her bike to the apartment and it was still pouring rain. She showed us the ins and outs, how the wash machine worked, where the fuse box was, telling us if we used the wash machine and/or dish washer at the same time the fuse would probably blow. She also showed us how to turn on and off the gas flow to the apartment – hopefully we would not need to know this. She gave us some suggestions for places to eat in the area and left us with instructions to just leave the keys when we left. We had not paid a security deposit for this apartment. Rae, your photographs are outstanding and so vivid (especially the food shots!) but I think my favorite is the umbrellas in the rain…..although the David shots are pretty gorgeous…….you are very lucky you didn’t get hurt seriously with your falls………and my suitcase always seems to have the same problem yours did, although believe it or not, mine rarely gets over 25 pounds and I’m in the UK for 4-6 weeks! I learned the hard way about taxi stands in London in the West End, and it seems pretty common throughout Europe and fair……..the worst taxi stands are at the Glasgow airport……….and as for your Piazza della Passera origin, I much prefer the sparrow to the prostitution angle! Great blog and I thank you! Once again I enjoyed walking beside you on this journey. I always feel I’m right there with you in the way you describe the historic sights and the delicious looking and colorful food you’ve eaten. Your photos are beautiful! You capture every detail! Thank you for sharing your dream which now has become a reality. Can’t wait to follow you on your next adventure!